When Tropical Cyclone 33W, also known as Usagi strengthened to hurricane intensity as it approached Vietnam from the South China Sea it dropped a lot of rain. Although the storm weakened to tropical storm intensity when coming ashore in Vietnam, it continued to generate a lot of rain, and NASA added up that heavy rainfall. Very heavy rainfall and damaging winds accompanied tropical storm Usagi when it hit Vietnam’s southern coast. More than 350 mm (14 inches) of rainfall was reported causing widespread flooding around Ho Chi Minh City. 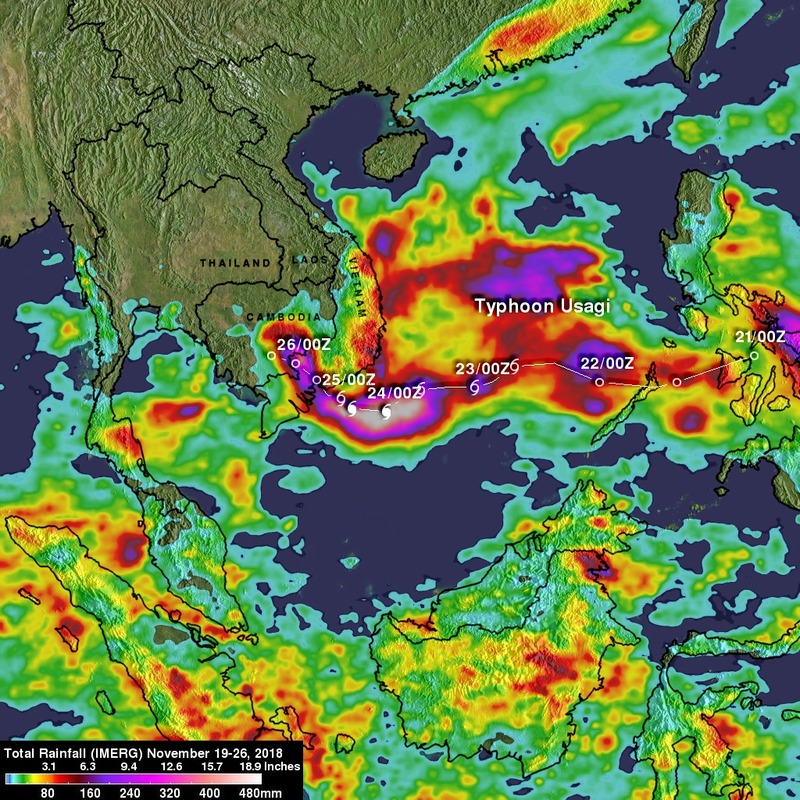 NASA’s Integrated Multi-satellitE Retrievals for GPM (IMERG) data were used to show estimates of rainfall accumulation produced by Usagi as the tropical cyclone moved across the South China Sea into Southeast Asia. An IMERG accumulation analysis created at NASA’s Goddard Space Flight Center in Greenbelt, Maryland encompassed the period from November 19 to 26, 2018. Those data indicated that Usagi dropped moderate to heavy rain along its path. The analysis showed that tropical storm Usagi often dropped more than 240 mm (9.4 inches) of precipitation over southern Vietnam. Rainfall intensity decreased rapidly as the remnants of Usagi moved inland over Cambodia. 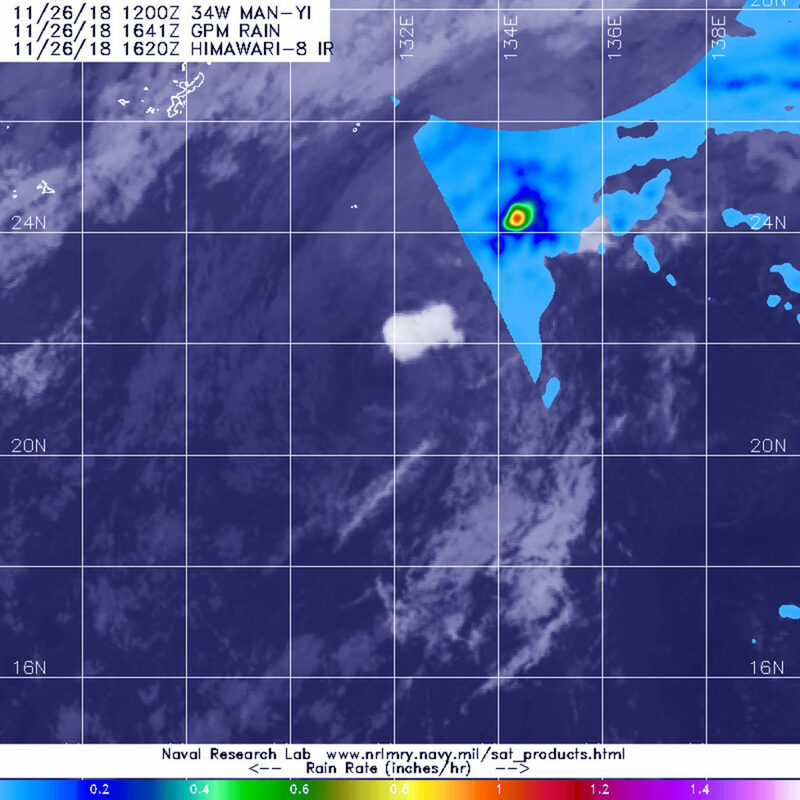 Tropical Cyclone Man-yi appeared elongated on satellite imagery as it continued moving in a northeasterly direction in the Northwestern Pacific Ocean. Man-yi was being affected by wind shear and was becoming an extra-tropical cyclone. 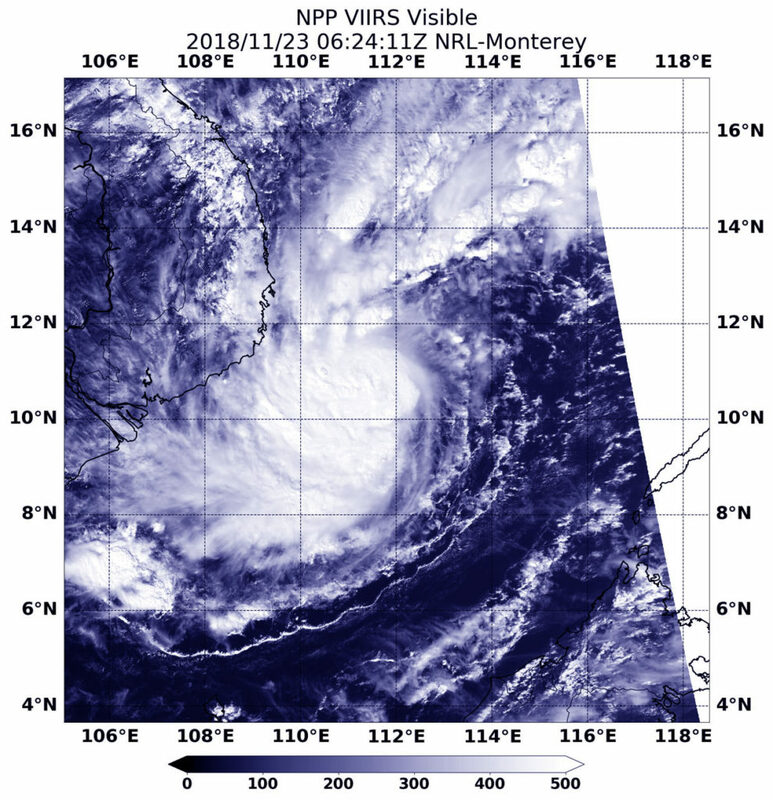 On Nov. 27, the Visible Infrared Imaging Radiometer Suite (VIIRS) instrument aboard NASA-NOAA’s Suomi NPP satellite analyzed Tropical Cyclone Man-yi. A visible image showed that wind shear was affecting the storm and it was elongated from southwest to northeast. In general, wind shear is a measure of how the speed and direction of winds change with altitude. Winds at different levels of the atmosphere push against the cylindrical circulation center and weaken the storm’s rotation. On Nov. 27, the Joint Typhoon Warning Center issued the final warning on Man-yi. At 10 a.m. EDT (1500 UTC) Man-yi’s maximum sustained winds were near 30 knots (34.5 mph/55.5 kph). It was located near 24.1 degrees north latitude and 133.8 degrees east longitude. That’s approximately 351 nautical miles east-southeast of Kadena Air Base, Okinawa, Japan. Man-yi was moving northeastward. Man-yi already started the process into an extra-tropical transition. That happens when a tropical cyclone has lost its “tropical” characteristics. The National Hurricane Center defines “extra-tropical” as a transition that implies both poleward displacement (meaning it moves toward the north or south pole) of the cyclone and the conversion of the cyclone’s primary energy source from the release of latent heat of condensation to baroclinic (the temperature contrast between warm and cold air masses) processes. It is important to note that cyclones can become extratropical and still retain winds of hurricane or tropical storm force. On Nov.27, Man-yi is expected to complete extra-tropical transitioning in the next day. Once a typhoon, Man-yi has weakened to a tropical storm as it continues to track through the Northwestern Pacific Ocean, far to the east of Taiwan. The GPM core satellite provided a look at the rain rates throughout the storm and found heaviest rain displaced to the northeast of the center. The Global Precipitation Measurement mission or GPM core observatory satellite is a joint satellite mission between NASA and the Japan Aerospace Exploration Agency called JAXA. GPM provided an analysis of rainfall within Man-yi on Nov. 26 at 11:41 a.m. EST (1641). Microwave Imager (GMI) instruments revealed heaviest estimated precipitation was falling at a rate of greater than 30 mm (1.2 inches) per hour northeast of the center of circulation. That heaviest rainfall was displaced from the center because of moderate vertical wind shear pushing it from the center. In general, wind shear is a measure of how the speed and direction of winds change with altitude. Wind shear can tear a tropical cyclone apart or weaken it. At 10 a.m. EST (1500 UTC) on Nov. 26, Man-yi was a weak tropical storm with maximum sustained winds near 35 knots (40 mph/74 kph). It was centered near 21.4 north latitude and 132.1 east longitude, about 406 nautical miles southeast of Kadena Air Base, Okinawa Island, Japan. Man-yi has tracked north-northwestward. Man-yi is expected to maintain strength for another day and then be absorbed by the mid-latitude westerlies (winds) and begin extra-tropical transition. Man-yi is expected to be fully transitioned into an extra-tropical cyclone by Nov. 28. That means that a tropical cyclone has lost its “tropical” characteristics. The National Hurricane Center defines “extra-tropical” as a transition that implies both poleward displacement (meaning it moves toward the north or south pole) of the cyclone and the conversion of the cyclone’s primary energy source from the release of latent heat of condensation to baroclinic (the temperature contrast between warm and cold air masses) processes. It is important to note that cyclones can become extratropical and still retain winds of hurricane or tropical storm force. When NASA-NOAA’s Suomi NPP satellite passed over the Ca Mau Peninsula it captured a visible image of the dissipating former Tropical Cyclone 33W. The Ca Mau Peninsula is the southernmost area of Vietnam, located between the South China Sea to the east and the Gulf of Thailand on the west. The Joint Typhoon Warning Center issued its last advisory on 33W known as Usagi, on Sunday, Nov. 25, 2018. On that day, Tropical Storm 33W weakened to a depression after making landfall near Ho Chi Minh City, Vietnam. Maximum sustained winds had weakened to 30 knots (34.5 mph/55.5 kph) and it continued weakening as it moved further inland. At 2:12 a.m. EDT (0712 UTC) on Nov. 26, the Visible Infrared Imaging Radiometer Suite (VIIRS) instrument aboard NASA-NOAA’s Suomi NPP satellite analyzed Tropical Cyclone 33W’s disorganized remnants dissipating over the Ca Mau Peninsula. 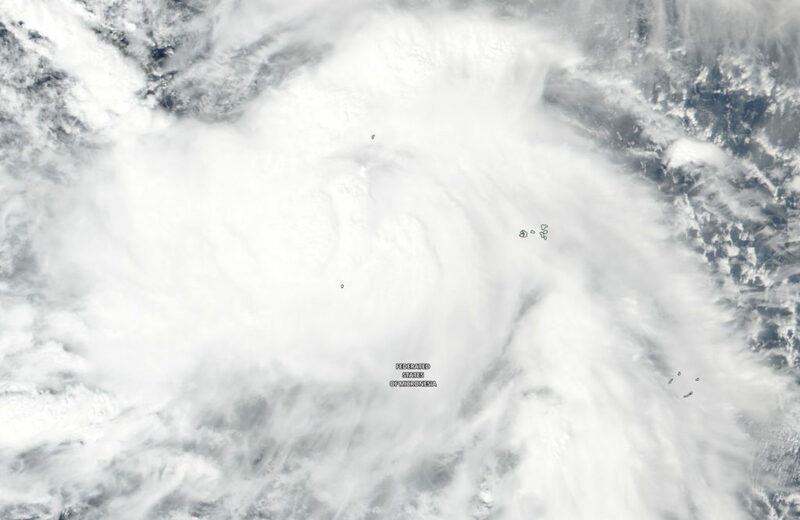 Visible imagery from NASA’s Aqua satellite revealed Typhoon Man-yi’s eye had become cloud-filled. On Nov. 23 the Moderate Resolution Imaging Spectroradiometer or MODIS instrument aboard NASA’s Aqua satellite provided a visible image of Typhoon Many-yi in the Northwestern Pacific Ocean. The MODIS image showed that clouds had filled in over the eye, and the storm had become elongated. The elongation indicates that the storm is being affected by outside winds and will likely weaken. The Joint Typhoon Warning Center or JTWC noted at 10 a.m. EST (1500 UTC) that Man-yi had maximum sustained winds near 85 knots (98 mph/157 kph). It was centered near 16.9 degrees north latitude and 135.3 degrees east longitude. That’s 729 nautical miles southeast of Kadena Air Base, Okinawa, Japan. Man-yi was moving north-northwest. JTWC has forecast Man-yi to move northwest and begin weakening. It is expected to make a sharp turn to the northeast. It is expected to pass east of Okinawa Island, Japan. 33W was a tropical depression when it crossed the southern and central Philippines. As it moved through the South China Sea over the last two days it strengthened into a tropical storm and was renamed Usagi. On Nov. 23, NASA-NOAA’s Suomi NPP satellite captured a visible image of the stronger storm on approach to Vietnam. Suomi NPP passed over 33W on Nov. 23 at 1:24 a.m. EDT (0624 UTC) and the VIIRS instrument provided a visible image. The VIIRS image showed 33W had strengthened and its center was surrounded by powerful storms. Bands of thunderstorms wrapped into the low-level center from the southern quadrant. At 10 a.m. EDT (1500 UTC) Tropical Storm 33W or Usagi was located near 10.4 degrees north latitude and 110.4 degrees east longitude. That’s about 243 nautical miles east of Ho Chi Minh City, Vietnam. 33W was moving west and has maximum sustained winds near 55 knots (63 mph/102 kph).The Joint Typhoon Warning Center or JTWC noted that 33W may intensify slightly before making landfall on a day. Tropical Depression 33W moved through the central Philippines and entered the Sulu Sea when NASA-NOAA’s Suomi NPP satellite provided a visible image of the storm. The Sulu Sea is located west of the central and southern Philippines. The VIIRS instrument aboard the Suomi NPP satellite revealed that 33W’s center was in the Sulu Sea on Nov. 21 as the elongated storm extended over the island of Palawan. 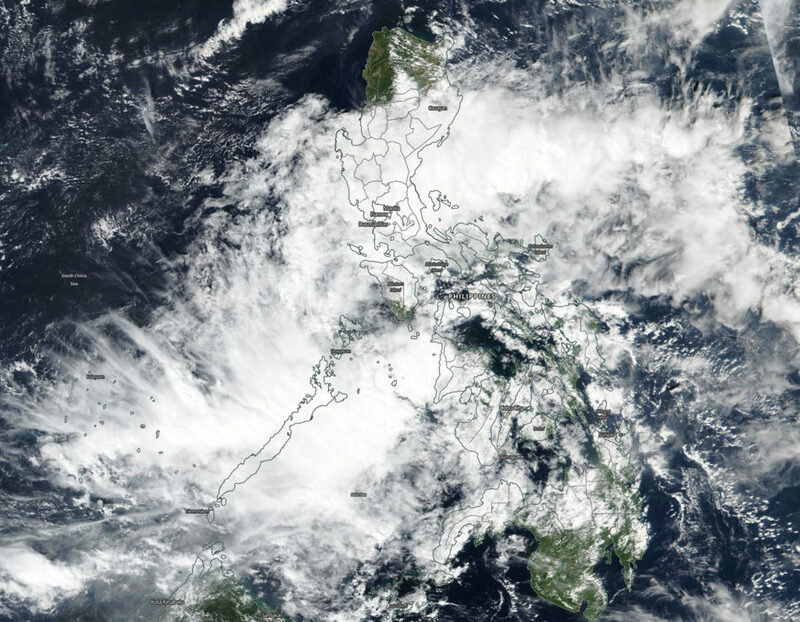 The storm appeared stretched out from southwest to northeast, and clouds associated with the depression stretched back into the central and northern Philippines. 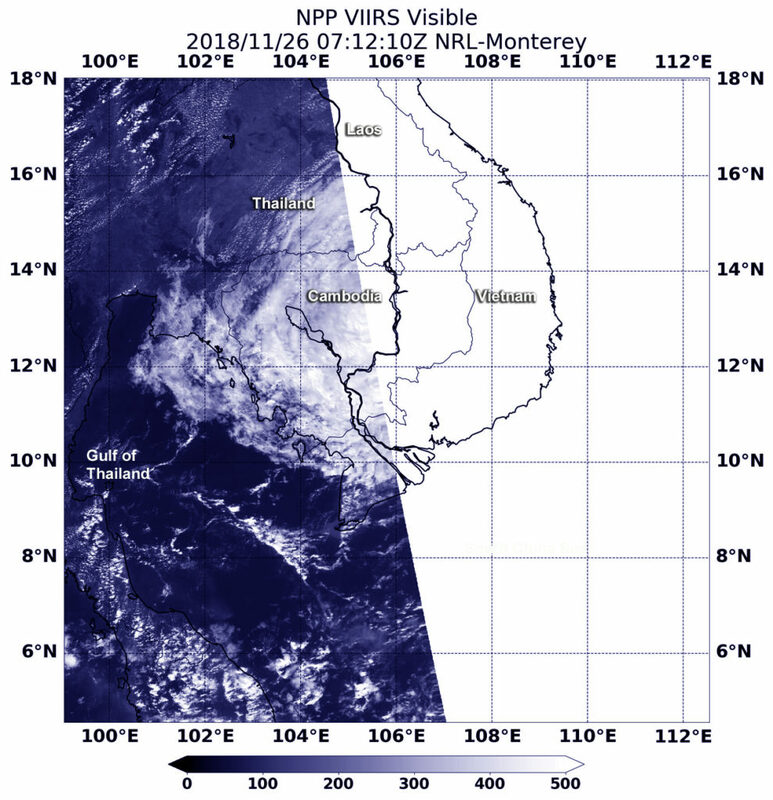 At 10 a.m. EST (1500 UTC) the center of Tropical Depression 33W was located near latitude 10.7 degrees north and longitude 119.8 degrees east. That’s 237 nautical miles south of Manila, Philippines. 33W is moving west-southwest. Maximum sustained winds remain at 25 knots (29 mph/46 kph). 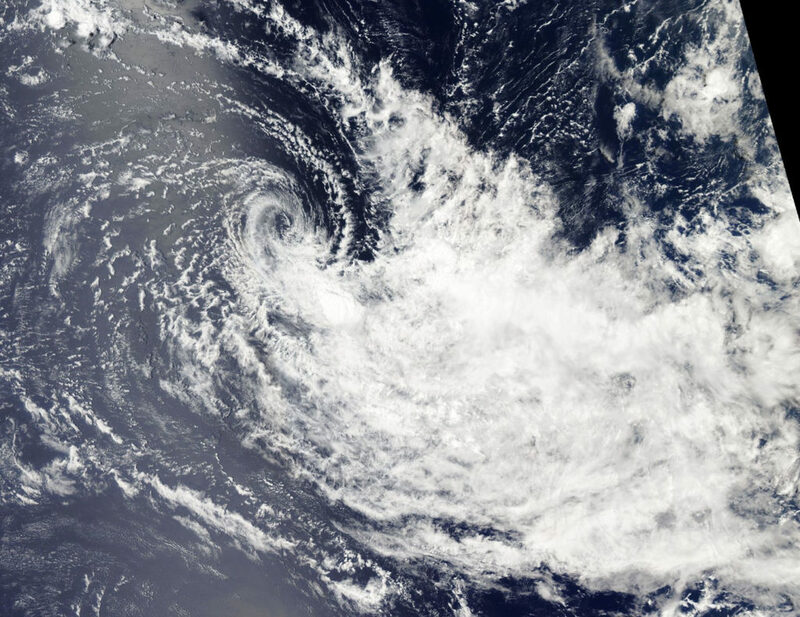 Tropical Storm Man-Yi continued to strengthen in the Northwestern Pacific Ocean as NASA-NOAA’s Suomi NPP satellite provided a visible image of the storm. Warnings are in effect through the Federated States of Micronesia at the storm continues to affect the region. The National Weather Service (NWS) in Tiyan, Guam noted several watches and warnings in effect. A Tropical Storm Watch remains in effect for Fais and Ulithi in Yap State. 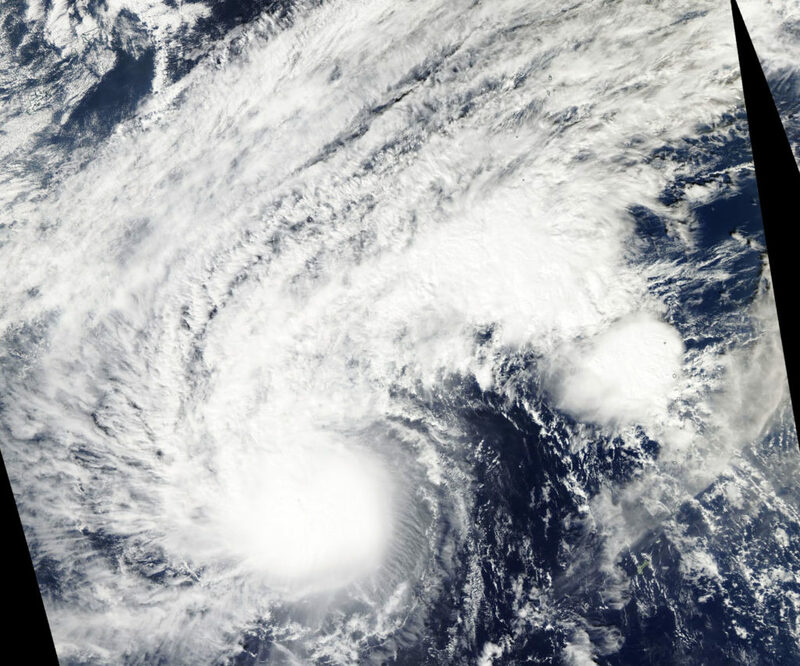 A Typhoon Watch remains in effect for Faraulep in Yap State. A Tropical Storm Warning remains in effect for Satawal and Faraulep in Yap State…and for Guam and Rota in the Mariana Islands. The Suomi NPP satellite passed over Man-yi on Nov. 21 and the VIIRS instrument provided a visible image. The VIIRS image showed Man-yi was a large and strong tropical storm over the Federated States of Micronesia. Tropical storm force winds extend outward from the center up to 115 miles making the storm about 230 miles in diameter. At 7 a.m. EST (10 p.m. CHST local time/1200 UTC) the center of Tropical Storm Man-yi was located near latitude 8.9 degrees north and longitude 146.5 degrees east. Man-yi is moving west-northwest at 23 mph. It is expected to maintain this general course and speed over the next 24 hours. Maximum sustained winds remain at 65 mph. Man-yi is forecast to intensify through Thursday possibly becoming a typhoon as it moves in a northwesterly direction. Maximum sustained winds are forecast to peak near 110 mph on Friday, Nov. 23. 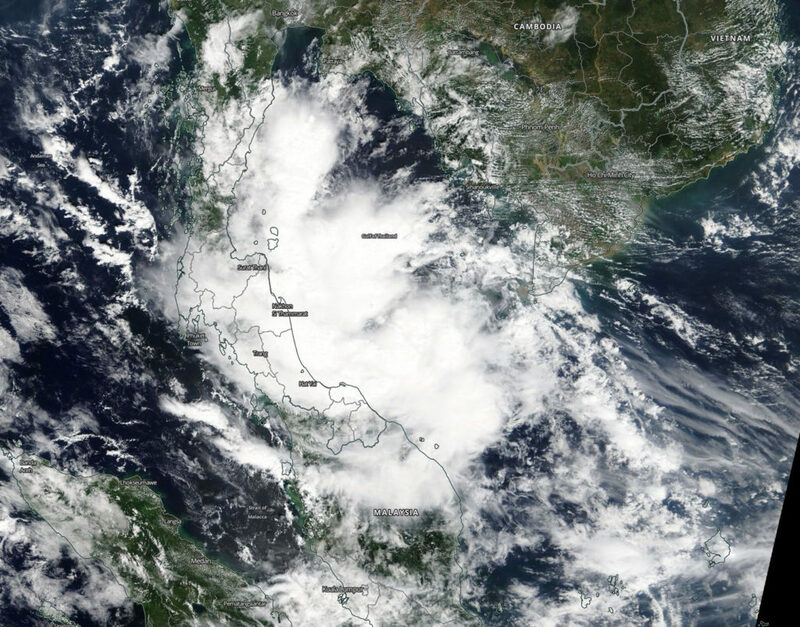 Visible from NASA’s Terra satellite revealed the extent of Tropical Depression Toraji as it continued moving through the Gulf of Thailand and affecting southern Thailand and Malaysia. 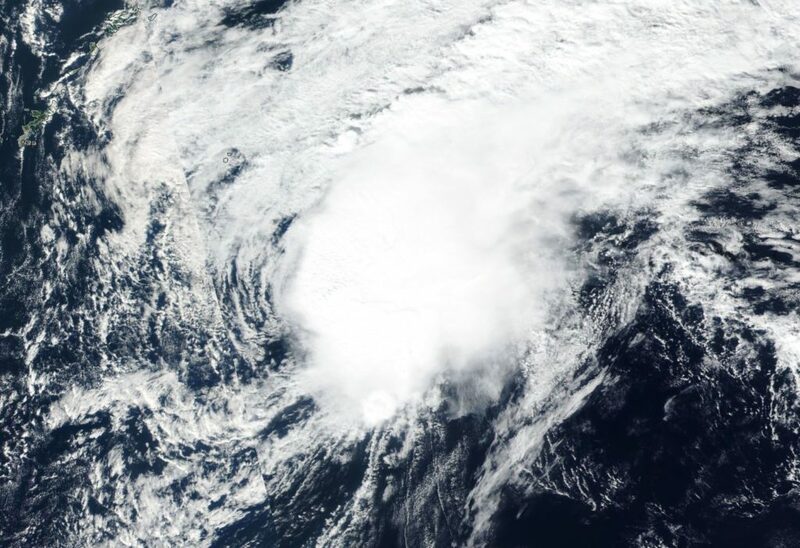 On Nov. 20 a visible image from the Moderate Resolution Imaging Spectroradiometer or MODIS instrument aboard NASA’s Terra satellite showed that Tropical Depression Toraji appeared somewhat disorganized. Toraji’s elongated northern quadrant stretched into the northern Gulf of Thailand, while the western side of the storm stretched over land from Surat Thani south to northern Malaysia. Toraji formed on Nov. 19, fizzled and regenerated in the Gulf of Thailand on Nov. 20 after a brief existence. At 10 a.m. EST (1500 UTC) Tropical depression Toraji, known previously as Tropical Depression 32W was located near 8.3 degrees north latitude and 102.0 east longitude, about 340 west-southwest of Ho Chi Minh City, Vietnam. Toraji was moving to the west-southwest and had maximum sustained winds near 25 knots (28.7 mph). Tropical Cyclone Bouchra may have been re-born over the weekend of Nov. 17 and 18 but by Nov. 20 it was blown apart by wind shear and NASA’s Aqua satellite confirmed that. On Nov. 20 the MODIS or Moderate Resolution Imaging Spectroradiometer instrument aboard NASA’s Aqua satellite saw Tropical Storm Bouchra being torn apart by winds. The center appeared almost cloud free while the bulk of clouds were pushed to the southeast. That’s an indication that winds or wind shear was affecting the storm and elongating its circulation center, weakening the storm again. By 4 a.m. EST (0900 UTC) on Nov. 20, Bouchra was already weakening and the Joint Typhoon Warning Center issued their final bulletin on the system. At that time, maximum sustained winds were near 35 knots (40 mph/62 kph). It was located near 5.4 degrees south latitude and 78.0 degrees east longitude, about 604 nautical miles southeast of Diego Garcia. Wind shear had increased since Nov. 19 and was pushing the bulk of clouds to the southeast and about 150 nautical miles away from the center. Bouchra is expected to make its final dissipation by the end of the day on Nov. 20.